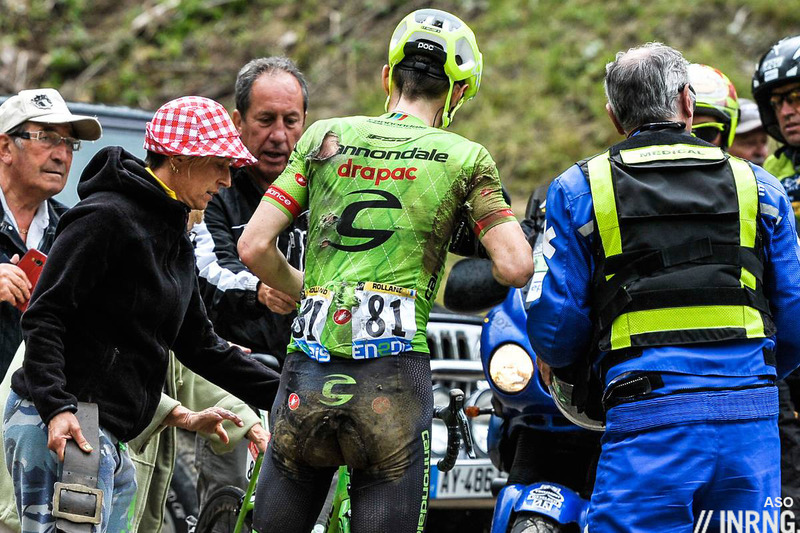 A lively stage in the Alps that was transformed by the rain and the audacity of Romain Bardet. Chris Froome crashed and if he got up quickly he was wincing on the podium as he collected his yellow jersey with a giant bandage on his knee. Tame move: The stage started and 20 riders went clear on the Collet de Tamié in what was an elective attack, those who wanted to go clear could go while everyone else stayed behind in the peloton. Astana: It looked limp until later on the climb Astana suddenly massed on the front to the point where several were riding clear. The sky blue jerseys of Astana were to feature on the front of the bunch from here until the the foot of the final climb. Dumoulin out: The 20 rider group never got more than four minutes and it was down to three as they reached the Doron valley. A freak crash took out Tom Dumoulin, he fell across the road and landed on his wrist and abandoned in tears. The news this evening after a visit to the race’s mobile X-ray truck is that he’s fractured his left wrist and his Olympic ambitions are in doubt. Majka’s Coronation: As the Tour climbed the Bisanne for first time ever the bunch discovered how hard the climb was and Adam Yates was at the back. He’s been doing this a lot on the climbs but it surely frays the nerves of his management. 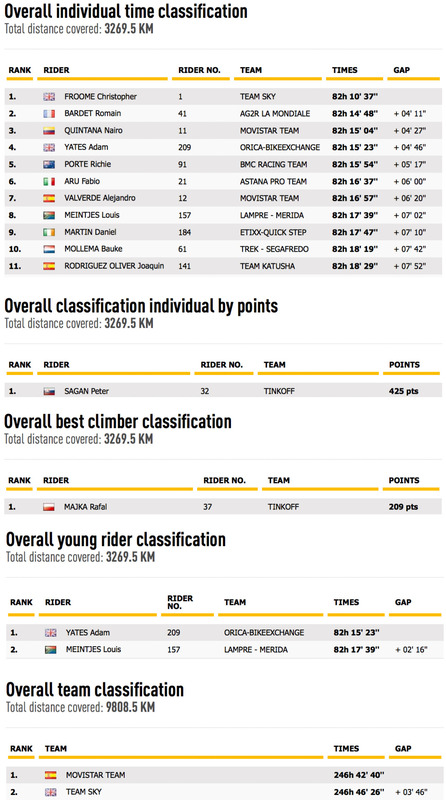 Over the top of the Bisanne Rafał Majka sprinted clear to take full points and gain an arithmetically unassailable lead in the mountains competition, he just needs to reach Paris to win. Just Add Water: As they crossed from the Bisanne to the Col des Saisies it began to rain and this turned into a downpour for the descent. Pierre Rolland was the first to fall as he slid out on a bend. Soon Richie Porte was in difficulty, he looked unmarked as if he’d ran off the road but had to chase and in the meantime Daryl Impey got to the front of the bunch as if he wanted to make Porte’s life even harder and protect Adam Yates’s podium place. More crashed, FDJ’s Seb Reichenbach fell with team mate Steve Morabito and then on a roundabout Bauke Mollema crashed. He was chasing with team mates and initially it didn’t look serious but he was about to fall off the podium too. Spontaneous: As they rode back down yesterday’s time trial course Ag2r La Mondiale’s Mikaël Cherel had words with Romain Bardet about an attack. Cherel got into a low tuck and began to drift clear of the yellow jersey group and Bardet threw his rain jacket to the side of the road. Next was the Domancy “Route De Bernard Hinault”. This road was a key feature of the time trial stage and if it is steep and twisting to climb it’s treacherous in the wet. Now add freshly-laid blacktop and paint from supporters and it was even more sketchy. While Bardet was threading his way down the hill suddenly the TV cameras switched to film Chris Froome standing in the middle of the road on his feet once again. This time he was up and running only on a bike borrowed from Geraint Thomas. Pear-shaped chainrings: Even if Thomas’s bike had identical geometry it lacked one crucial thing for Froome: the ovoid chainrings. Froome has been using these for years but L’Equipe reported the other day that Shimano has tried to stop the rest of the team from using them. Whether Thomas likes them or not doesn’t matter, the point here is that Froome was suddenly back on round chainrings and this is a very different pedalling action. If you think the oval rings look odd then the reverse holds true, someone used to them finds round chainrings equally bizarre to pedal with, the feel of the pedal stroke is alien. 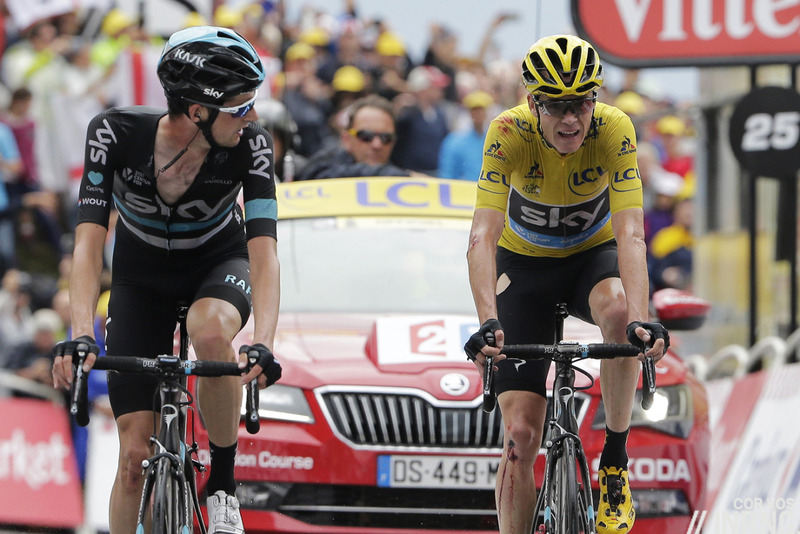 All this and Froome’s elbow and knee were bleeding and he had a big hole in his yellow jersey. Ahead Cherel, Bardet’s body double, was pacing his leader to the foot of the final climb. It looked brave bordering on reckless, at best they could hope to take 30 seconds, no? Victor Hugo once wrote that “in the Alps you are either an eagle or a cretin” and we’ve seen plenty of riders trying to soar only to get humiliated by Team Sky and pay for their attacks by being dropped and lose time. Ag2r La Mondiale knew this and in the morning the team briefing was to stay still until the final climb. Only here was the Cartesian Bardet once again, the masters student abandoning his race management thesis for a wild gamble. Sure this wasn’t a 100km raid but going solo against Team Sky, BMC, Astana and Movistar before the final climb had started was something few others dared envisage. Froome’s crash disrupted the chase behind, nobody was waiting for him but it meant Sky were not setting the pace. Bardet began the final climb with about a minute’s lead. Bardet’s race radio was off too and so he didn’t know what was going on behind. In the team car behind Vincent Lavenu was hurling encouragement into the mic without knowing it could not be heard. Lucky for Bardet because there was a lot happening back there. For once Wout Poels was trying to slow the pace of the group on the final climb in order to make life easier for Chris Froome but his attempts didn’t last long as Dan Martin, Richie Porte and Fabio Aru launched a flurry of attacks which distanced Adam Yates. Meanwhile Bauke Mollema was far behind and alone. 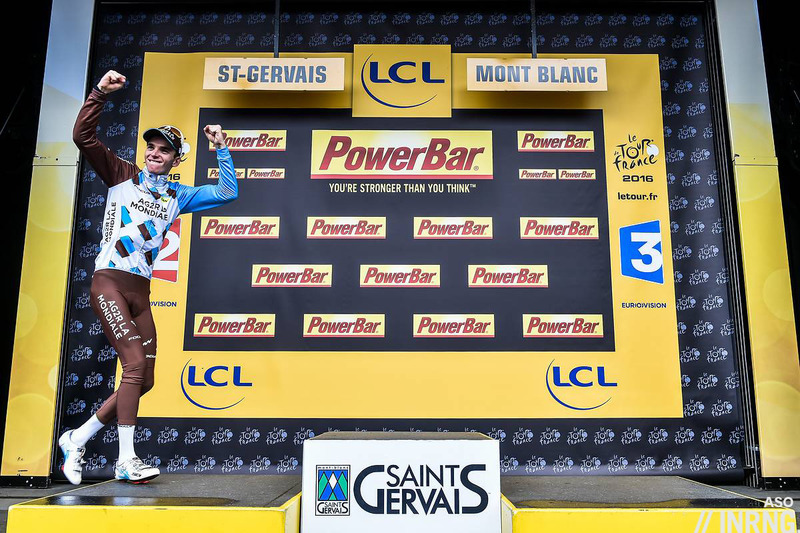 Bardet hung on for the stage win and was overwhelmed, sitting up before the line in celebration rather than pressing for every second but he’d done enough to take second place and took the ten second time bonus. Boring Tour: after he finished Bardet said he and Cherel just decided to go in a “crazy move” and said he was aware of the comments about a boring race so far but said he was waiting for his “window” to open. Today doesn’t erase the series of flops and mishaps from a host of GC contenders but it does restore some fo the balance. It’s bold enough to attack on the descent when others are falling like skittles but here was a rider with ambitions for the podium going clear with 16km to go by himself rather than waiting to snipe a few seconds on the final climb in the hope rivals fell by the wayside. French win: there have only been two editions of the Tour de France without a French win, 1926 and 1999 so this is narrowly avoided. Does it matter? Only if you see the sport through nationalist glasses which tends to happen less in cycling but it’s always helpful when the home nation gets a slice of the action. The difference this time compared to previous French triumphs was that this wasn’t a consolatory win like Bardet enjoyed last year after his GC bid had fallen apart. This time Bardet was in the hunt for a podium spot and he’s now closer to this goal. The only negative to the day was the crashes as a form of the action. But when Froome went down he appeared to be forcing the pace with Vincenzo Nibali only to slide out on a white line. The pair crashed and it took a moment until the others arrived. This was a pure handling error. GC Shake-up: for all their work today Astana saw Fabio Aru take back eight seconds and move one place higher overall from 7th to 6th overall as Bauke Mollema fell from 2nd to 10th, a cruel result for the likeable rider. The Dutchman has been struggling in recent days but looked like he’d lose seconds only to surrender four minutes. Yates lost time and copped a 10s time penalty after being caught taking a handsling from team mate Ruben Plaza. Meanwhile Nairo Quintana is now third overall largely thanks to staying upright. More: if today had action, tomorrow’s stage is equally promising given the mountainous profile ahead. There have been concerns about the Col de la Ramaz with rockfalls and roadworks but it is open and so there’s no change to the planned course, only that heavy goods vehicles like the publicity caravan will detour around to lighten the load. Then comes the monstrous Joux Plane. Not that I’d wish a crash on anyone but the fact a day like today can appear from nowhere is why, whatever the lead, the race isn’t won until Paris. Out of the 3 big crashes Froome was the lucky one. What will tomorrow bring….I can’t wait. Is there any actual good reason why some people are accusing Porte of riding for Froome? Because he happened to be lurking in front of Froome for a while instead of lurking behind him for a change?? I am flummoxed! But I would like to state my appreciation for this blog and the tone of the comments. I may disagree (frequently and vehemently at times) but I never come away from here feeling like I had a cup of Stupid thrown in my face like I do on Twitter, and for that I am deeply thankful. Hopefully tomorrow will be as compelling and less crash-prone. Thanks again for your blog. David Millar suggested that Porte asked Froome’s permission before he attacked. Porte did turn towards Froome, but I couldn’t see if he said anything, never mind the fact that we can’t possibly know what he said. People just love a conspiracy – although you do wonder with some of the deferential treatment Froome has been getting on this Tour. Earlier in the race, Luke Rowe gave Yates a shove up the road. An illegal move and had it been two Italians (for example), some British people would have been up in arms about ‘typical Italians’, etc. So what do they do? Fine them, probably. I’m sure Yates didn’t asked to be pushed so I’m not sure he should be punished and giving illegal assistance isn’t usually punished by more than a fine. And I’d say exactly the same if they were Italian, French or Nepalese (and, by the way, they are different nationalities). Rowe should be fined, I suppose. But it happens all the time. I was only using it as an example of how people can blow things out of proportion. As for their different nationalities, well I suppose that depends on your point of view. They hold the same passport. I look forward to watching the RBS 2 Nations and 4 bits of another Nation Rugby Championship next year. Yates has been fined 10 seconds for a push from a team mate – unseen by cameras, but seen by commissaires. I’ve seen it go unpunished – and hand-slings – but he can’t complain. Yep, fined for hand sling by Rubén Plaza. Seems hand slings are only allowed in the Dauphine. Mollema doesn’t seem to be blaming his crash for his time loss. Nice to see someone not using an available excuse. Porte said he ended up sliding on his front. Marginal gain: someone of a similar height to Froome in the Sky team starts riding on an osymetric chainring? Damn Froome – crashes, takes a bike from a team member and still is up there! Guess those wacky chainrings don’t make all that much difference? Aru attacks, rides like he doesn’t care what happens (BRAVO!) while Porte suddenly remembers he’s the team leader and might get on the podium….and blows up yet again. The only real mystery to me is why-the-hell Nibali, one of the best descenders in dicey conditions was BEHIND Froome..who has been sketchy but improving? Oh….and why did Froome’s need a new bike? A fairly simple loss-of-the-front end crash makes the thing useless? What are they using to make Pinarellos these days? Tough carbon fibre.. but not Nibali-proof! He said on RAI interwiew that just ended the slide on Froome’s bike and that was the bad side of the crash. Froome’s descending has greatly improved (the idea that he’s rotten is based on how he was a few years back), but you don’t ride on a white line on a wet downhill. Pathetic how easily those bikes break. Take all that electronic rubbish off them and make them a proper weight so that they’re strong. Froome went down on his right side. Maybe a derailleur or the hanger had broke. Maybe his wheel was buckled. Maybe the brake was just knocked out of line and in the heat of the moment he thought the wheel was buckled. It’s a solid lane marker, how do you suggest someone take the racing line through a corner without crossing it? Don’t take the normal racing line, thus don’t stray over the line. Well you can ride over pretty much everything as long as your centre of gravity is, er, centred. As soon as you lean to one side or stand up, you have to be a lot more careful about what’s under your wheels. Froome lost front tire on the centre white line. It’s something you can expect but not avoid sometimes. It was about lines of descent: Nibbles came on the tarmac – inner line – bad luck, had to pinch and fall, no other choice. Weather and roads dictate, a skilled one has to comply and pray for good. As much as I respect Jens. but his armchair commentator view is a bit counteracted for a guy who I saw crashing very badly on dry descents, sometimes more than once in one. Yes, in theory you have to avoid this and that and though never crash on a descent. But non-theory aka reality tells us the opposite. Rolland didn’t hit a white line and his wheel slipped. Especcailly in wet conditions avoiding white lines gets harder, cause you can’t take a corner in ideal line, to avoid slipping on the non-white parts of the wet road. Just riding along on a bikepath near a river this spring, I suddenly lost control on a wet patch with some green algae. One moment riding the next sliding on the tarmac. No turn, more or less in a strait line. Amazed how easy it is to loose control. I don’t know what happened to Froome’s bike today, but the frame he uses in the mountains (Dogma F8X light) has a 70kg rider weight limit which should make it quite fragile. Crashing hard on the drive side is a good way to knock things out of line too. Weight limit is about material stress cycles. Carbon fiber is all but fragile. True is, when a hit overcome tensile strenght – in some peculiar directions – it produce kind of explosive fractures. Froome’s bike issues – as I had seen on TV – could have been some displacement and/or breaks due to Nibali’s hit. “fragile”? You probably mean brittle, right? Froome did the right thing by not tinkering with his own possibly damaged bike knowing that “G” was behind him with a bike that fits him quite well. At that point he was probably thinking that the team car will come up soon and give him his own replacement bike. That’s why I would rather not interprete too much into this event with regards to the toughness of Pinarello frames. Most of the carbon frames used nowadays are not really designed / tested to survive loads created in a crash. If they were they would be much heavier. Interestingly most of the pros who are not supposed to fight for GC ride bikes which are well above the weight limit although a bike with a production version of the same frame and the same equipment is under the weight limit. So, their frames are already reinforced and therefore heavier than the production model because of the added stress of crashes, spending thousands of kilometers on roof racks while the driver goes fast and the higher loads that come with racing on a professional level in general. Do you have any proof/evidence to back up this claim? The bike biz says the UCI sticker on these things means it’s the same bike the punters can buy, no? A specially reinforced frame for the pros would put a big dent in their marketing claims – same as when/if a big star has a bike built for him by a “builder of trust” instead of using the team issue machine. I have it on fairly good authority that a few top pros are doing the latter, but have never heard of the former. I was always told the gregari ride what they’re given…. there was a story about this in German TOUR magazine some years ago. They were allowed to properly test some rider’s bikes. Greipel and Voigt were two of them, but there were also riders of lighter guys with GC-ambitions. Testing for them also means disassembling the bikes and taking certain measures to evaluate the stiffness of the frame: bb stiffness, torsional stiffness from head tube to drop outs, vertical stiffness at the seat tube. They were curious why the bikes seemed to be heavier than what they expected when looking at the components. What they found out was that some of the frames were much heavier that the production version but also even stiffer. I remember Greipels frame weighing as much as 13xx grams. When confronted with their findings the manufacturers said that they had to reinforce the frames with additional layers of carbon in certain areas (water bottle cage mount area of the down tube and seat tube, seat tube in general, bottom bracket area, head tube area) to account for the much higher stresses those frames see in professional racing. As I said this does not apply to all bikes used in the World Tour especially not those used by GC riders but probably the majority of domestique bikes. If you read articles about pro rider’s bikes as published by cyclingnews.com or bikeradar.com you will notice that the total weight of those bikes is often way in the 7.x kg area although there is no heavy equipment hanging off the frame and wheels are some light carbon hoops with tubulars. But the production version of the same bike with comparable componentry but with considerably heavier clincher wheels is right at the UCI weight limit or even below this. Specialized for one seems to have addressed that “problem” in a different way. Maybe due to the effect that they sponsor so many teams maybe due to a big number of “warranty” claims by “punters” that actually race their bikes (I’m speculating here). Their current S-Works Tarmac frame (the production version) is much heavier than the competition with medium sized frames weighing around 1100 grams which makes it one or maybe even THE heaviest of the high-end carbon race frames you can currently buy. In turn it has become by far the stiffest production carbon racing frame leading the benchmarks with regards to bb and torsional stiffness. I can’t help but feel bad for the Dutch. Mollema out of podium contention with 2 days until Paris. 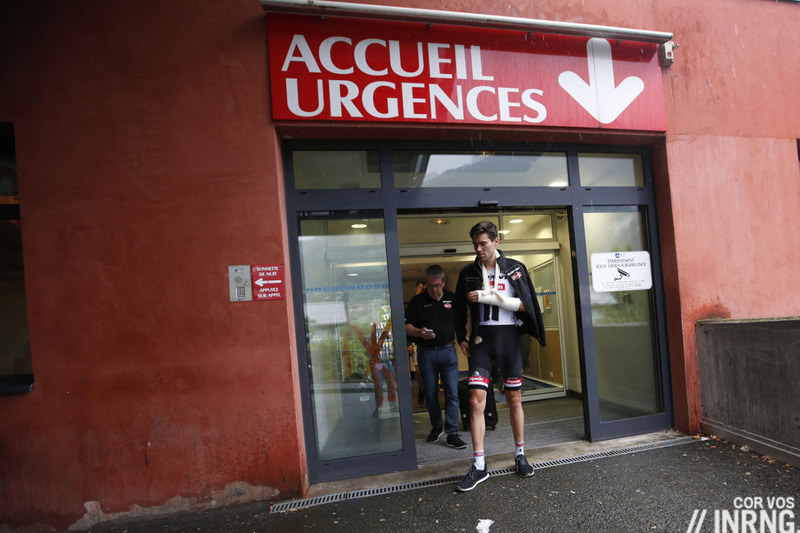 Dumoulin abandons with a broken wrist and his Olympics are in doubt. Kruiswijk and his terrible last day in the Giro… It really hasn’t been their summer so far. anyone worried about him tomorrow? Most wouldn’t attack him if he turned up with half a leg missing. He’s too strong, you see, and so is his team: there’s no point trying. It will be interesting but I think the big fight will be between the next 3, there are big gains to be made over a couple of handfuls of seconds, unless froome shows he’s really struggling early on. A big descent at the end and thunder storms forecast again so any could happen. Froome will suffer badly on the Col de la Ramaz and Joux Plane and Bardet will attack again, riding out of his skin to win the tour by a handful of seconds on the descent into Morzine, ending a 31 year drought. That would be freakin’ awesome! Talk about making the race exciting! Prob won’t happen tho…..
Can’t speak for the likelihood of this but this such a nice change from the dismal tone of just about everyone else that I wish you a good day, and hope you find a large bill of the currency of your choice in your pocket or similar. The weather forecast is looking like it will rain tomorrow, so yes, I am worried for him. It all depends, too, if his knee stiffens up overnight. It’s not a dissimilar situation to last year in a way; Froome has a cushion of time so he could, to some degree, ride his own tempo. The problem will be if the attacks some early. The finish is off a downhill from Joux Plane as well. Ahhhhh! “The finish is off a downhill from Joux Plane as well. Ahhhhh!” Right, but there is no continous white centerline on that descent. 😉 if I recall correctly. So he should be safe. The descents from Aravis and Colombier should be no big deal even in the rain. Just a few demanding turns. He won’t lose much time there. Descending from the Ramaz is a little more challenging while the Joux Plane has the best (=most interesting) descent of those four passes. I assume after today’s crash he will be overly cautious in the descents tomorrow if the weather forecast becomes reality. A normal psychich reaction and hard to overcome. Rather accept it then try to override it. If you’re not Nibali it takes time to get the confidence back after a crash. But still if his team stays with him he won’t lose his full advantage only in those descents. That will probably not keep Astana and Ag2R from bringing the race to him right in the first descent. Nobody had to attack Froome immediately after his crash. But not attacking on the flat section, not attacking in the first section of the final climb, while Froome was agonising ? In contrast, they didn’t wait for Mollema who was close behind after the last descent. Then not attacking in the middle section of the climb. Still waiting 3 km of the finish. Then Martin made an effort, but he hasn’t the legs and the skils to defeat the other climbers. Porte was asking and looking to Froome and then took the lead. No jump at all ! And Aru, after let his team work the whole day, began to sprint with a coffee mill gear…. and took 2 lengts….. Then Froome was reassured. The only rider to have respect for, was Bardet. At least, he tried. Normally he should have been caught at 4 k of the finish. But then all the contenders had to much respect for the ripped skirt of Froome, and let Bardet win the stage. 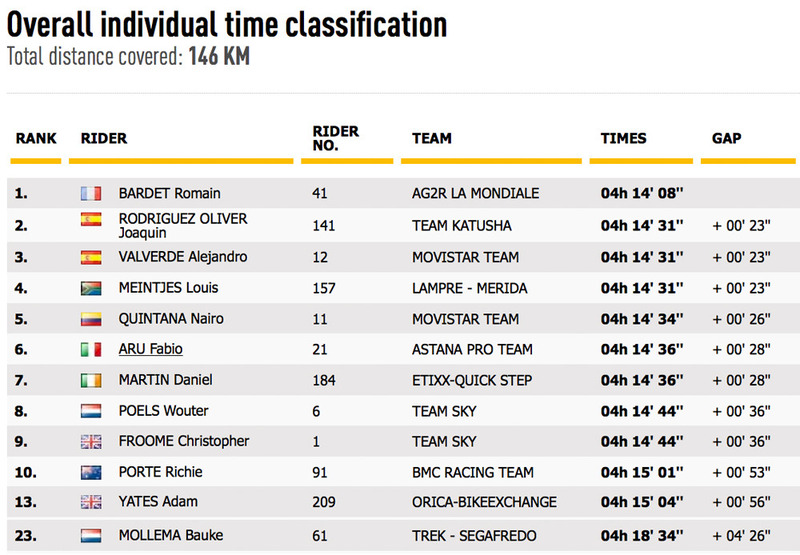 But at the end, Bardet was the only one who deserved to win today. Kind of stating the obvious, but they were probably timing later attacks to limit risk of blowing up too soon (eg Porte and Martin). I don’t think anybody was doing Crash Froome any favours…pretty sure nobody waited for him except his teammates who were able to pace him back to the others. Mollema sadly did not have a super Sherpa in the wings. That’s ridiculous commenting regarding no one having the guts to attack Froome. You seem to think every attack should be successful. Trying and it not working or getting brought back is all part of the game. Porte and co have been continually abused on here for not attacking, and now they do and it doesn’t work and you assume they are basically in cahoots with Froome. Get serious. The pace was fast enough that Yates was dropped. I agree that Bardet deserved to win, but that’s all I can agree with. They didn’t attack at all. And they waited for Froome. I’ve seen every second of the race. An accelaration or a minor attack 2 or 3 km from the finish line is ridiculous. It’s what happened in the Armstrong age, then Wiggins, now Froome. They just haven’t the guts. To correct Larry T above, apparently Porte did crash, but like Mollema’s one, the TV cameras missed it. He said he left some skin on the road and that combined with the effort to chase back on probably caused his drop off in the last kilometre. Meanwhile Quintana who has looked second rate all Tour is rising up the placings by virtue of luck as all his rivals hit the deck around him. Porte did say that he crashed. However, Quintana staying on his bike is not luck. Most crashes are caused by rider error – not luck. Going downhill is a skill – especially in the wet. Could be more rain tomorrow. Completely agree. Having the right tyre pressure when rain is forecast is not luck. Porte has said his tyre pressure was too high, even in the dry and was a cause of his crash. Dan Martin very frustrating again. It’s a shame that his attacking is costing him seconds on gc while some other limpets are just sitting tight to Paris. Short term memory problem as Vuelta 2014 will testify. All you can say with any clarity is that if you ride your road bike fast, in all conditions, then at some point your likely to have a mishap and that is likely to include all pro-cyclists. Porte mentioned something about too much pressure on the tires on after stage interview. For what I saw so far Porte is not better on classification because BMC’s approach and his mentality flaws. I put on BMC’s count the lack of support at puncture occasion and tire preparation. The entire stage was on TV and 10min before transmission of road on IT4 they are talking about rain on the last part of the race. About his mentality I saw problems on both time trial. He began too strong and was fading along the way. Powermeter is a worthy tool for pacing! He’s a good TTer, his past on triathlon should be something for it too. The first TT was long one, was too windy and he said he could hear anything from radio, someone could say those affected him, but I was really expecting more of him on that 2nd TT. His time was not bad, but apparently comparing his splits with Aru’s splits he could be 10s better. About who’s working for who VN came up with interesting interview explain why is not so easy attack Sky. A note Rolland: the beginning of the year Vaughters and Cannondale’s coaches speak a lot about about his training, his TT preparation and his personal record of losing time for lack of support on the first week of the Tour but he’s been one of the best climbers on third week. I payed closely attention on him and he was safe on first week, he began to lose time on the second week because of crash occurred by slow puncture on the front wheel on a 10km descend. He must be crazy feeling front wheel losing control slowly and don’t stop before. A big recipe for disaster. Seeing his crash today it seems the tires let him down again (too much pressure I believe). Well his TT performances didn’t seem anything special like was of Mollema (1st TT) or Purito (2nd TT). 23 comments, 8 from J Evans. Sure gabriele still writing on same amount of essays for later. But always outnumbered by Anonymous – and so many of those are nothing to do with cycling. We have found Froome’s weakness.. the rain. I guess we already knew though from the 2013 Worlds and 2014 Tour. He’ll be a bit stiff and sore tomorrow, plenty of dicey descents too, and the forecast says rain. How much on Bardet to go early, put Froome under pressure, all hell breaks loose and we have the first French winner in 31 years? Yeah, maybe not. This is a scenario I believe could happen easily. Bardet cannot attack too early on the last climb, but his team or others need to do a “Sky train” tomorrow setting a high tempo from start for cracking Froome until the last climb. Send up two or three riders up the road right at the beginning. Sky will probably let them go as they did throughout the whole TdF. Then attack the descent of the Colombière where Froome will most probably not follow Bardet or at the latest the descent of the Ramaz. Even that will probably not earn Bardet 4 minutes if Froome is able to go close to his normal speed uphill. A shame we have to desire bad weather to shake things up…it’s like F1 or MOTOGP where skill (and luck) come into play enough to make a difference. Sure, Porte fell off….so did Froome….then Froome did very well keeping up with his challengers while Porte faded…..same s__t, different Grand Tour. Marrying Victor Hugo quotes with Tour de France commentary… I am, as usual, in awe. Chapeau to Bardet also… has anyone else spotted the similarity to Champion from Triplettes de Belleville? It was in the paper edition two days ago. Presumably because Shimano have paid to sponsor Sky’s groups, and don’t want to see them using a competitor’s chainrings? No one hinders Shimano to produce such chainrings for Sky. I once had such ovoid Shimano chainrings, so I don’t see the real problem. The old Biopace chainrings are quite different. Ossymetric, since bought by Stronglight, has a patent on the large cam / ovoid version used by Froome. Ah okay, didn’t know there are different ovals. Just a geometry guy…..
Much rolling of dice, some got lucky and made the most of the opportunity while others rue their misfortune. Staying upright is indeed a skill but if someone goes down in front of you there is nothing that can be done, sometimes the results are very unfortunate, ask Tom Dumoulin. The difference between Richie Porte’s puncture on stage 2 and Chris Froome’s crash today is instructive. Froome had a team mate on hand within seconds handing over his bike whereas Porte was on his own with neutral service……. Shame about Adam Yates but without a better team in the mountains it is always going to be very hard at the sharp end. Froome did look banged up afterwards though think of Contador in the Giro last year, he raced on with a dislocated shoulder (admittedly not in the big mountain stages). He wont be the first nor the last to race on with various wounds. Hopefully tomorrow doesnt turn into some sort of demolition derby in the rain. Will Bardet pay for his efforts today? Astana and BMC have big motivation to turn up the pace, I suspect Sky will ride at their own pace, no need for any heroics, leave that to those behind in the GC. If it does rain, the final descent off the Joux Plane could be more carnage as they’ve just resurfaced it this week as well. More fresh Tarmac, hopefully not too much fresh slippery paint. Thanks for the info, MD. One might wonder why they don’t do the resurfacing earlier. Maybe you can’t do anything if someone goes down in front of you, but you *can* make a decision to give yourself enough space on a descent to react and avoid other riders. Or alternatively burn an extra match to stay on the front. Either strategy would likely cost extra energy, but can entirely eliminate the “nothing that can be done” situation in the first place. Decisions like these happen all the time – that’s what makes it racing. 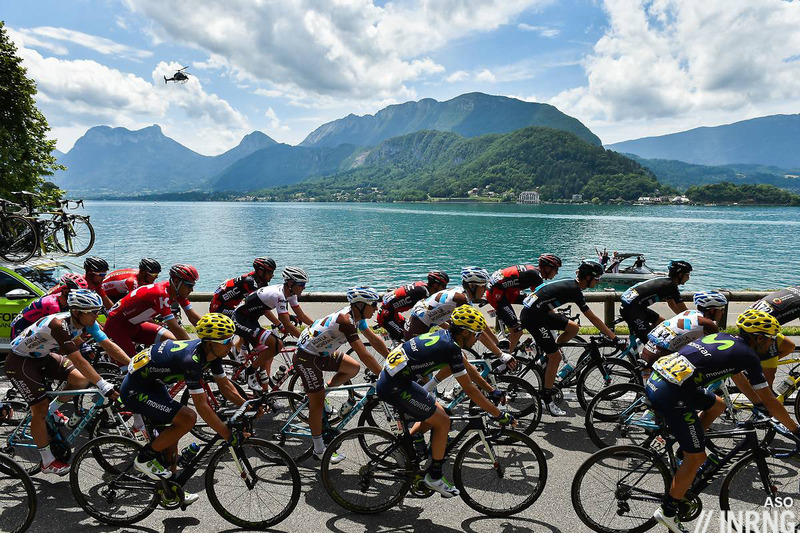 Excellent report on the tons of action in today’s “boring” TdF! One question: Anticipating rain, would there have been any advantage to a rider actually stopping and changing bikes to one with tires better suited to wet conditions? It’s more about getting the pressure right, perhaps no need to change bikes but to start the day with a bit less air in the tires? Though it would have been interesting if disc brakes were still allowed. They make a massive difference to braking in the wet, but how many teams would have picked them for today’s stage? Disc brakes don’t mean a thing if the tires can’t grip the road surface. No one crashed because the brake pads wouldn’t bite into the rims, they crashed because they locked up wheels or misjudged their center of balance. Grip is about tire compound and pressure, but more than anything grip is about how the tire is loaded. That means technique and judgment – things that are always within a rider’s control. With technique and judgment, you lock up less with disc brakes than rims, especially in the wet. Thanks! Froome is one tough cookie. I suspect he could have held his own riding a 1956 Huffy with balloon tires and coaster brakes. If Porte realized his tire pressure was too high so early in the stage, couldn’t he have easily radioed to his team care to let 7 psi out of the tires and engineer a bike change? Or perhaps his comments are framed entirely in retrospect. Bardet by far the best of the French riders going in to the tour, by far the best coming out of it. Move to a bigger team, work on his time trialing and winning one of the grand tours surely must be on the cards for the french man? Bardet’s linked on a long term deal to Ag2r La Mondiale and likes it there and he’s central to the team so a move elsewhere seems unlikely. A piece about how he’s worked to shake-up the team and its management is overdue on here. Looking forward to that, would certainly be an interesting read. He’s definitely one of the most exciting riders at the moment. Would love to see more info about Bardet… My favourite rider by a long way. I think this spells the end of TJ van G as a tour contender at least as a designated leader. I think he is a fine rider but three weeks is simply too much for him. I think Pierre Rolland is another experiment that has come to an end. Well unless both join Sky then they ll be competitive in two years. Stiff knee tomorrow for Froome, it will loosen up I am sure, but nothing more. he can take it fairly casual and enjoy the scenery. Cartesian Bardet. Genius from Inrng yet again. Did Bardet shout ‘cogito ergo sum’ as he crossed the line ?? STS – many thanks for the details! So in addition to the stars getting special “builder of trust” machines painted to resemble the team issue, the bike brands also make special versions for pro team use that are stronger (and heavier) than those sold to the punters under the “Same bike as your hero rides” advertising claptrap. Kind of ironic when you consider the body-fat percentage of those guys vs the punters…if anyone needs the stronger frame it’s “Joe Crankarm” who is overweight and pedals squares when compared to the pros! Same as it ever was.